King Mackerel: Commonly referred to as a kingfish, this is go-to fish among the charter fishing fleet because of its abundance and aggressive feeding habits. They can provide some fast action that even some of the most experienced anglers find exciting. They typically travel in schools, so multiple hook-ups at the same time are common. Often times they will feed very close to the boat and ‘sky rocket’ a bait, soaring more than ten feet in the air with the bait in its mouth. The larger kingfish are called smokers for a couple reasons; 1. When they are hooked, they take off like a bullet, smoking the line off the reel. 2. The bigger fish get oily flesh and are best cooked in a smoker. 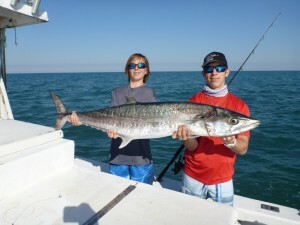 King Mackerel Fishing Tips: Most kingfish are caught while slow-trolling live bait in the vicinity of some type of bottom structure, whether it be a natural reef or artificial structure sunk for the purpose of fish habitat. Sometimes they are also caught while trolling for dolphin, wahoo and sails. Although, they are well known to clip your baits off right behind the hook while trolling. That’s why most people employ a stinger hook in the back of their baits when targeting kings. As far as edibility of the kingfish goes, there are a few rules; 1. The smaller kingfish are the best eating. 2. Always maintain optimum freshness with them, otherwise they can taste fishy. 3. Eat what you can while it’s fresh. 4. What you can’t eat fresh, have smoked. 5. The larger fish are better smoked because they can get very fishy.